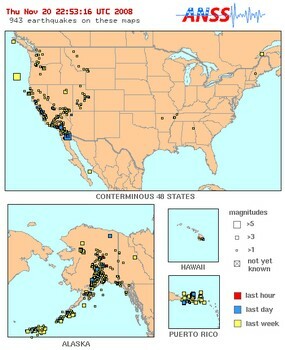 How about earthquakes and wildland fires? ThorntonWeather.com now features earthquake activity reports and wildland fire maps. Thanks to the wonderful community that surrounds weather station operators, we are pleased to announce two new features added to our site. Our new Earthquake Activity page displays earthquake data directly from the United States Geological Survey (USGS). A report at the top highlights activity within 500 miles of Denver and a map displays activity nationwide. Also new is our Wildland Fire Activity page that shows an integrated Google Map of all recent major wildland fires in the continental United States. You can click on any incident to get more details. Below the map is the latest wildland fire news from FireHouse.com. In light of the recent fires in California, this is a timely addition. Special thanks to one of our regular visitors, David Canfield, for this suggestion. Both items are now available under the Almanac menu item on the left. Do you have an idea of something you would like to see added or improved on ThorntonWeather.com? Don’t be shy! Let us know! Click here to contact us. This entry was posted on Thursday, November 20th, 2008 at 5:07pm MDT and is filed under Climatology, Site News. You can follow any responses to this entry through the RSS 2.0 feed. You can skip to the end and leave a response. Pinging is currently not allowed. A very cool new additions. Thanks for providing so much information!